Lori St John is an author, publisher, attorney, CPA and business expert. She is the founder of two boutique publishing companies created for cinematic worthy books, serving the serious minded author. Her impressive credentials are a result of her demand for excellence in all that she does. St John’s professional background and entrepreneurial spirit has driven her to master the art of self-publishing – not through the use of vanity publishing houses (which most people are inclined to think of when they think of self-publishing), but by mastering the art of publication. The #1 best-selling author of The Corruption of Innocence, a Journey for Justice, St John set out to compete with the big publishing houses, yet maintain control over her book destiny and keep the cash in her pocket. Her success drove her to educate others on how to accomplish the same. prompting her second book, How to Successfully Self-Publish, a 9-Step Guide to Cashing in on a Best Seller – the no- nonsense go-to guide to your publishing success. After intense research, and a love for learning, Lori St John has created an easy to follow 9-Step Guide that offers you insights into the art of publishing your book with complete control, ownership and success. is the go-to book on how to take control of your book publication destiny. Not everyone relishes in the intense labor of learning, but we all love to achieve! 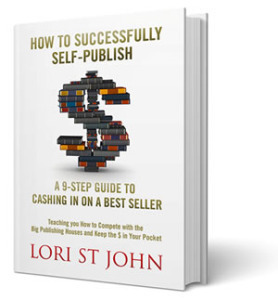 Let Lori St John share the cost saving insights and expertise from her own success in self-publishing, and allow that to become the masterful guide to your success. Do you want your book to reach millions through the film industry? Do you want to make a difference in the world, share your message, knowledge or story? St John’s non-fiction book, The Corruption of Innocence, a Journey for Justice was picked up by a seasoned Hollywood producer just one month after its release. Learn the secret to how she accomplished the unthinkable as a self-published author. Don’t wait another day to make your book a success. Grab your copy now! *Film rights purchased by J. Miles Dale, Executive Producer of The Vow, Endless Love, Love Happens, Flash Genius, and numerous other Hollywood movies. 29 Credits. Producer of the current TV Series The Strain.